Oman has a total of 5 CELTA centres with more planned on the way. 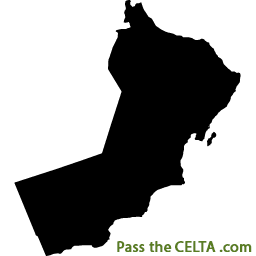 Getting CELTA certified in Oman is a smart idea when considering the many options for English language teaching there. CELTA centres in Muscat, Sohar, and Seeb offer CELTA candidates a comfortable learning environment in a professional setting. This wealthy Arab country famous for its delicious aromatic coffee, bustling vibrant souks, colourful and unique architecture, and Frankincense trees is a country steeped in history and culture. It’s definitely worth learning more about this beautiful and welcoming country, so when you plan on doing a CELTA course in Oman, make sure you give yourself enough time after studying to get to know more about this intriguing country.